Enhancing Our Heritage - Monitoring and Managing for Success in World Natural Heritage Sites was a seven-year UNESCO/IUCN project funded by the United Nations Foundation. The project commenced in 2001 and operated in nine World Heritage sites in Africa, South Asia and Latin America that have all been recognized for their biodiversity values. project proposals prepared and funding sought for large-scale projects required to address identified deficiencies. Based on the results of the project, recommendations were provided to the World Heritage Committee on a consistent approach to assessment, monitoring and reporting on the state of conservation and management effectiveness of World Heritage sites that could be applied to World Heritage sites on an on-going basis. The project was built around the application of the IUCN World Commission on Protected Areas (WCPA) framework for assessing management effectiveness of protected areas. The final output of the project was the completed "Enhancing our Heritage Toolkit", available in PDF format as the World Heritage Paper #23. 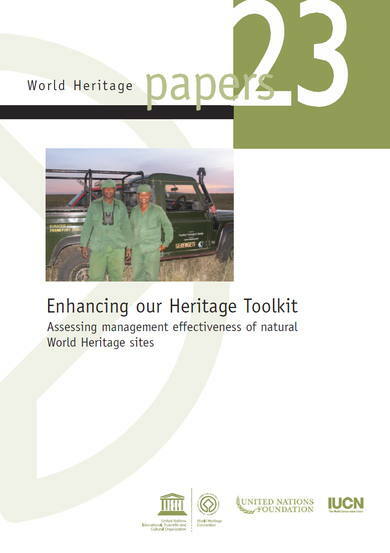 The documents listed below consist of the collection of assessments carried out by the nine World Heritage sites that participated in the development of the Toolkit, along with other related publications. These are a good source of case studies and examples for other World Heritage site, and protected area managers wishing to apply the Enhancing our Hertiage methodology in carrying out their own management effectivess assessments.